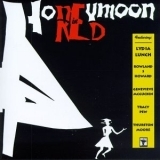 Honeymoon In Red is ranked 4th best out of 13 albums by Lydia Lunch on BestEverAlbums.com. The best album by Lydia Lunch is Queen Of Siam which is ranked number 12071 in the list of all-time albums with a total rank score of 110. The tracks on this album have an average rating of 79 out of 100 (2 out of 8 tracks have been rated). Related links: top tracks by Lydia Lunchtop tracks of the 1980s, top tracks of 1987.